MOURNING SIGN has come back to the scene 17 years after they split in 1996, and in 2018 they released their long overdue third full-length. The first thing I noticed about “Contra Mundum” is that it is not like what they put out in the 1990s. Where their first two albums were obvious Progressive Death Metal records with some experimentation, their 2018 release was definitely more Melodic Death Metal with slightly blackened elements. While there were Progressive moments, these moments were not often. I’m not usually one for Melodic Death Metal, but this was different. For whatever reason, this doesn’t sound like most Melodic Death Metal. It’s definitely got an epic feeling to it, and the melodies and rhythms, while predictable, are strong and are exactly what I want to hear. It also has this very streamlined sound very similar to black metal, but there isn’t a ton of black metal influence. It’s just really epic, diverse Melodic Death Metal written and played like Black Metal. “Contra Mundum” starts off very strong with “Dualism,” “Homage to a Dying World,” and “Nest of Vipers”. This theme is carried throughout the entire album, each track sounding just as melodic and epic as the last. In fact, it almost becomes formulaic. The guitar style becomes pretty predictable and the vocal melodies do too. The formulaic songwriting makes the music predictable, however, it never gets old. It’s a formula that really shines in its own way. It’s one of those formulas that everyone enjoys. The songwriting technique shines the most on the first tracks as well as “Who Will Crown the King” and “Sleep”. The latter of the two has an interesting section featuring clean vocals. Overall, this album really hits home for me. The melodies are all great and the songwriting has perfect flow, not one riff sounding out of place. The production is nice and gives everything a soft, rounded-out tone that is a nice break from the bleak abrasiveness of most metal production. 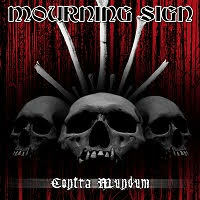 MOURNING SIGN may not have made a full comeback to Progressive Death Metal, but they definitely released something worth everyone’s time.